Hi everyone and Happy Holidays! I am excited to share the first part of my Holiday Home Tour with all of you. 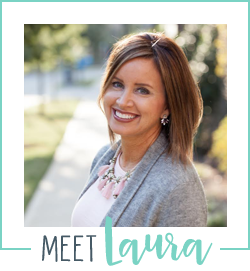 If you are new around here, you can find out more about me here and learn a little more about the Smart Southern Style blog here. I have broken up the home tour into two parts because I have a TON of Christmas decor in my home. It is my favorite time of year and I go a little crazy with the decorations. (My husband can attest to this, as he has to bring down ALL the boxes from the attic and garage each year!) Today, I am sharing my living room with you all, which includes our main Christmas tree, a smaller tree and some other decor. This is Rocky. He pretty much runs things around our house. First up...my favorite item in the house, our Christmas tree, of course! We get a real tree every year, because there is just something so special about a live tree and the amazing smell that goes along with it. Some of you may disagree, as I know they can be messy and require a little more work, but I am a sucker for a real tree. Last year I opted to buy a flocked tree for the first time. Previously, we always had a traditional green tree, but I thought it would be a fun change. I loved it so much, I bought one this year as well! I went for a lime green and bright red color scheme, because I think it is whimsical and traditional at the same time. I used 2 types of wired ribbons to loop in the tree. If you haven't done this before, it is quite easy. Just tuck the end of the ribbon in the bottom of the tree, and loop it about 1/3 of the way up, tuck it back in some branches, and so forth. I also used some wired netting horizontally around the tree to give it some more dimension. Another great way to add some texture to your tree is with greenery sprigs. I have several variations of these in my tree, as well as more on the top as the tree topper. I love whimsical ornaments and some of my favorites are this truck and camper set, hot air balloon, and photo frame ornament, Because I have so much color on my tree, I opted for a more neutral burlap tree skirt which you can shop here. Also in the living room, I have a smaller red flocked artificial tree. I thought it was unique and a bit whimsical and fun. Like my large tree, I looped some wired ribbon through this tree and added some greenery sprigs as a tree topper. An easy way to add some Christmas cheer to any room is to swap out your standard pillows for some Christmas ones. I added some on both my sofa and my side chairs. Find some traditional pillow options here, here and here. And for more whimsical options, look here, here and here. Another easy way to add some festivity to your year-round decor is by adding Christmas ornaments or sprigs to a container you already have. I have this set of bottles on my coffee table year round filled with lavender sprigs. For Christmas, I switch those out for some holiday sprigs. You can find these sprigs for containers or trees in many craft and home decor stores. I hope you have enjoyed this tour of my living room decor! Please come back on Thursday for the second half of my Holiday Home Tour where I will share my trees and decor in my dining room and family room. Thanks for reading along! Wow! That tree is amazing! It should be in a magazine! Love the idea of using all the sprigs and ribbons. I am going to add some to my tree! Thanks Michelle! You are too kind! I love decorating our tree each year. You can find the springs and ribbons at Michaels or another craft store and they are a great way to add more dimension to a tree!